At the top layer of the framework are the enablers. The key factor here is organizational leadership. There is a senior knowledge champion. The senior management team understands that knowledge is strategic and clearly articulates its contribution to the organization’s “bottomline”. 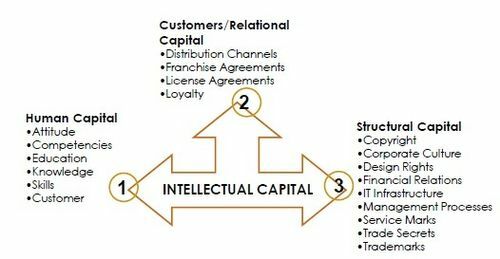 The organization’s structure, culture and environment encourage knowledge development and sharing. Without these enablers most knowledge initiatives drift or stall. Explicit knowledge is that which is written down or expressed in some tangible form, such as in a procedure manual, document or computer database. Tacit knowledge, on the other hand, is personal, in people’s heads and is difficult to articulate. It includes insights, experience, judgment and many other aspects of know-how and know-why. Managing explicit knowledge draws heavily on systematic processes for handling information, such as information resources management, as discussed below. Managing tacit knowledge, on the other hand, has more to do with managing people, and particularly the environment in which they operate. Hence design of space that encourages knowledge sharing, such as at British Airways new headquarters at Waterside near Heathrow, is an important lever. So, too, are ways in which people can interact to learn from each either, whether through knowledge sharing events, the conduct of meetings, secondment to other work groups or personal coaching and mentoring. Thirdly, the foundation layer provides the capacity and capability that embeds knowledge into the organization’s infrastructure. 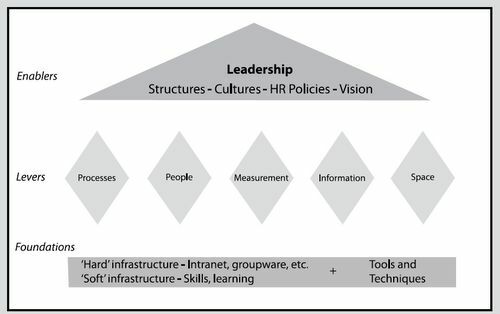 It comprises two complementary strands - a ‘hard’ information and communications infrastructure that supports knowledge collaboration, and a ‘soft’ human and organization infrastructure that develops knowledge enhancing roles, skills and behaviors. In this layer, the fast moving world of technology is providing an ever increasing number of useful tools for knowledge capture, organizing and sharing. There are now knowledge management suites, such as Open Text’s Livelinks, that combines document management facilities with functions that help create ‘communities of practice’, whereby people in different departments who are pursuing similar interests can be connected into electronic conversations. An effective knowledge management programme should therefore take a holistic view of the field and ensure that there is suitable balance between the various layers and strands. As far as information professionals are concerned, there are several ways in which they can make a valuable contribution to a knowledge program. Creating knowledge bases and developing knowledge centers are two of them. 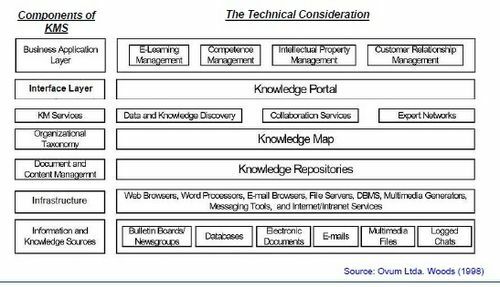 Source: Skyrme, D. J., “Knowledge Management: Making it Work”, Resources, <http://www.skyrme.com>, (Dec 2004). §In order to implement and sustain knowledge management, organizations need to make changes to the way their internal processes are structured. §Identify which processes constitute either barriers to, or enablers of, knowledge management. 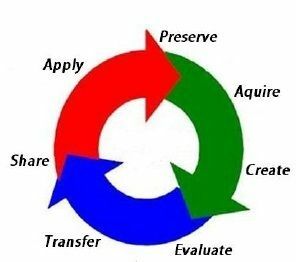 §How these processes can be adapted, or what new processes can be introduced, to support people in creating, sharing and applying knowledge? §activity such as research, observation, meeting, coaching, social network, portal and etc. §it can help connect people with information, and people with each other, but it is not the solution. §KM portal, discovery tools, applications, Knowledge Repositories, Expert Systems, Data Mining tools, Collaborative tools, etc. §Attempts to provide an answer to a problem with the consultation aid of human expert. •Characteristics of a problem are entered into a system, classified based on different cases, and provides a potential solution. This case and it’s solution is then added to the database. •From experience of maintenance activity, the system can produce result to the user and what action should be taken. •Based on information gathered from current and historical data , it can help forecast market trends, business patterns, profiling practices using algorithms. 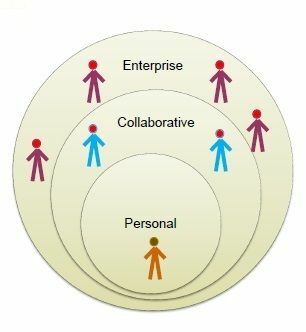 Technology : Collaborative Tools Facilitates interaction among individuals to encourage sharing.